Stephen Rex Brown Board Member Alexandra Militano discussed October’s applications for liquor licenses. Community Board 3 approved Jane’s Sweet Buns application for a beer and wine license last night, paving the way for the bakery to pair alcohol with its desserts. 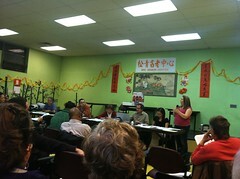 The business was met with skepticism by some members of Community Board 3, however. “I hear we’re all dying to receive this: A bakery that sells booze,” joked board member Joyce Ravitz.